** Please note that we are often closed for long weekends around major holidays. Call ahead for more details. 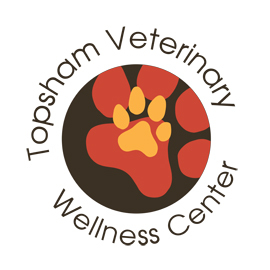 Welcome to Topsham Veterinary Wellness Center! If you live in Topsham or the surrounding area, let us take care of your furry family members! Dr. Amy Ruksznis is an experienced veterinarian who wants to build a relationship with you and the dogs and cats of the community based on care and collaboration. Have you heard about our Wellness Plans!?! To empower pet owners with the knowledge it takes to raise a healthy, well balanced animal. To prevent disease by providing comprehensive wellness exams to the four legged members of the family. To address problems acutely and astutely to prevent complications that come with chronic diseases. To be involved in the community so that we may establish a sense of extended family for animals and their owners. Meet our veterinarians who offer a wide variety of medical, surgical and dental services in our veterinary clinic. Our veterinary hospital is well equipped with advanced equipment and technologies to provide the highest standard of care for your pet. Our facility has the equipment to provide comprehensive in house testing for accurate diagnosis, digital x-ray, surgical suite, dental suite, pharmacy, and more. Not sure if it's the right fit? You are more than welcome to stop to meet our staff and tour the facility. If you'd like to bring your pet along for the ride, please call ahead and make sure we have time to make the visit a laid back and comfortable one. We are excited to meet you! Owner Amy Ruksznis, DVM wants to work together with pet owners to keep their four-legged family members as healthy as possible. Beyond first rate pet care, we hope you'll notice our wellness center is comfortable, kid-friendly, and a very calm environment. A visit to the veterinarian should always be a positive experience for you and your pets. Here in Topsham, we hope you'll find us patient, kind and resourceful when it comes to making your pet comfortable and on the road to better health. Our website is full of helpful information on proper care of your furry family members. Browse around and look at our articles and pet videos. The best veterinary care for animals is proper nutrition and problem prevention. If you want to ask a question call (207) 406-4468 or email us and we'll promptly get back to you. Our Topsham, Maine veterinary office is very easy to get to, and you can find directions on our Contact Us page. Please browse our website to learn more about our hospital and the veterinary services we provide for companion animals in Topsham and the surrounding areas. Read information in our Pet Library, view videos, take a virtual tour of our veterinary hospital, read testimonials, and find details about upcoming events. Please call our office today at (207)406-4468 for all your pet health care needs or click here to contact us or to set up an appointment.